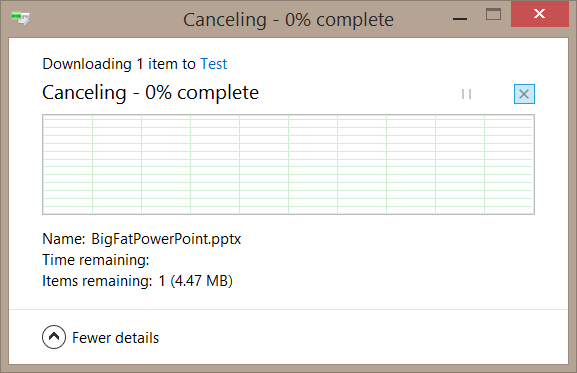 One of the things that I’m really happy to see in Windows 8.1 is a more complete inclusion of SkyDrive. Windows 8.0 had SkyDrive – there was a built-in Store app but in order to do something on the desktop you needed to go and download a separate client app just like on Windows 7 or on OS X. As far as I know, in 8.0 there’s was a difference between the client app and the Store app. The Store app is accessing the SkyDrive RESTful services over HTTP to show you exactly what’s on your SkyDrive (which means it needs network connectivity and speed is limited by that connectivity) whereas the client app was more like a traditional sync client (like Groove, Live Mesh etc) in that the files were physically present on the various disks of your various devices and were sync’d via the cloud. I found that duality a bit odd – you could get 2 different views of “SkyDrive” and I tended to stick to the view of the Store app and avoid the desktop app which was odd because I’d generally always been quite a heavy user of the desktop app but once presented with these 2 views I couldn’t quite reconcile them so preferred the immediacy of the Store app. (it seems fair to say that there’s a whole bunch of comments on this blog post around the ins-and-outs of how SkyDrive sync is working out for people and also about the way in which it makes use of a Microsoft Account – given that the comments are directly on the Windows blog itself I’m not going to attempt to jump into any of that discussion – I’d expect that the product folks are reading, hearing and acting on those comments). which is a simple enough idea – a small metadata stub in the file system (“smart file”) backed by the “smarts” that allow the system to request more details from whatever service (in this case SkyDrive) is backing that “smart file”. “More details” might include a thumbnail picture that can be produced server-side for the file at a particular resolution or “more details” might mean getting hold of the whole file itself when it’s needed. and that can be done either in the explorer view as pictured above or in the Store app and then, as a user, you know that certain files will always be on your device if you want them (or at least until you remove that “available offline” option in the future) and the whole thing is a kind of “pay for play” scenario in that of course storing the full files is a lot more expensive than storing just a “smart file” metadata stub. then I can see that this file is only taking 8KB of space on the disk but if I double-click it then it’s brought down from SkyDrive on-demand so I can (in an online scenario) have the file without paying the price for it on my disk or I can just use the “available offline” option if I need the file when I’m disconnected and then it takes its full quota of disk space. This seemed novel enough to me to contemplate sticking all my photos and music into SkyDrive and then on specific devices I can play around with the online/offline nature of folders of photos and music according to how much disk space I have available and to what extent I use that device for photos/music in online/offline situations. With that in mind, I was particularly pleased to see that explorer embraces the idea of these SkyDrive folders being added to libraries. I tried that out with a couple of albums and copied a bunch of music (around 150MB) into a SkyDrive folder called Music, made sure it was only available online and then added it to the Music library on the machine and then wandered into the Music app on Windows 8 and all seemed to work pretty well in that my music showed up and was playable. If I took the machine offline I can still see all my tracks inside of the Music app but they don’t play. Strangely, the music app just didn’t seem to “do anything” when I tried to play a track that would only be available online. It didn’t error and nor did it hang. It just didn’t do anything but this might be a “preview” thing. When I looked at those files/folders in the SkyDrive app, it was more direct. 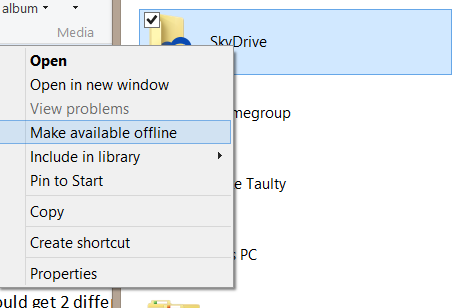 It told me that I was offline and it told me that only the “offline” files would be available to me. I found that interesting enough to try an experiment. While offline, I went to my SkyDrive view as presented by explorer.exe and created a new file called foo.txt. 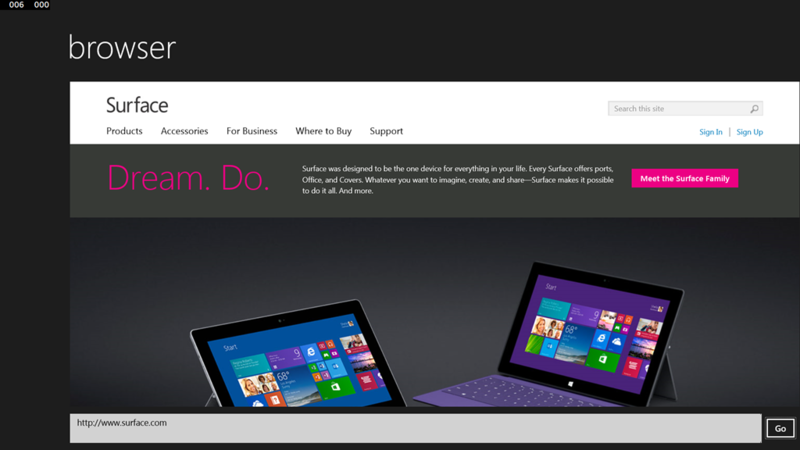 I went into the SkyDrive Store app and had a look to see if foo.txt showed up. It did show up which is exactly what I’d want but it made me wonder how this is being done. 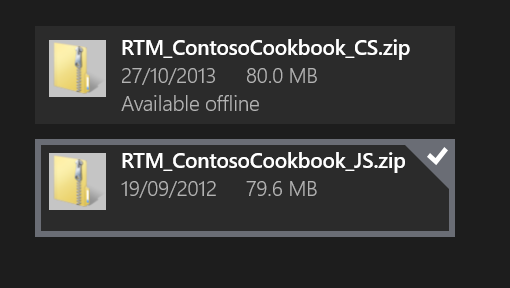 Clearly, this can’t involve using the Live SDK to go and make RESTful calls to SkyDrive when the device is offline. This must be happening locally and then being sync’d to the cloud. 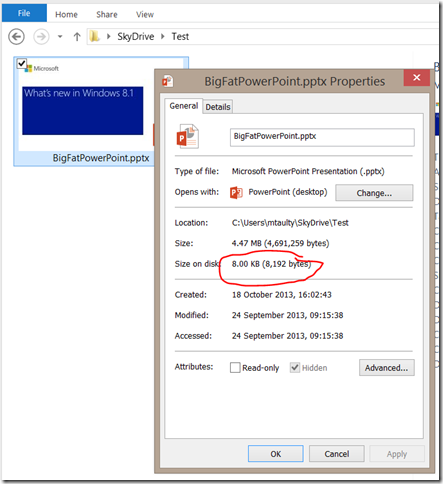 How does a Store app in 8.1 best access SkyDrive files/folders? Does it use the Live SDK and talk directly over HTTP to the cloud or does it use another mechanism like the built-in SkyDrive app seems to? 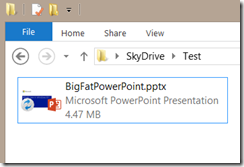 How do those new “smart files” work in a traditional desktop app? 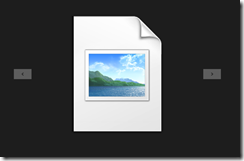 How does an app from (say) Windows 7 work when it encounters this new kind of file? 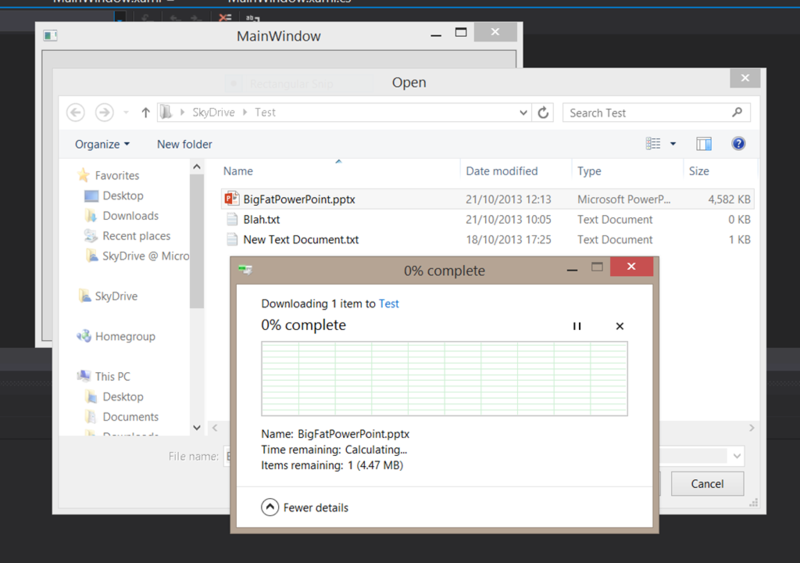 I thought I’d experiment a little and started with the second area – desktop apps that work with files and, in Windows 8.1, are going to perhaps encounter “smart files” for the first time. The file dialog stays on screen while the “downloading” dialog appears over the top of it and because I was on such a poor network this took way too long and I hit the cancel button. but in the end the cancellation request seemed to get heard and the “cancelling…” dialog went away and, as a user, I got returned to the file open dialog. I wondered to what extent this might be related to my attempting to read the file synchronously so I tried to read it asynchronously but that didn’t seem to make any difference. I must admit that I was a bit surprised that the machine seemed to spend time trying to go off to the network and displayed the “downloading” dialog even though Windows was telling me that it wasn’t on a network. 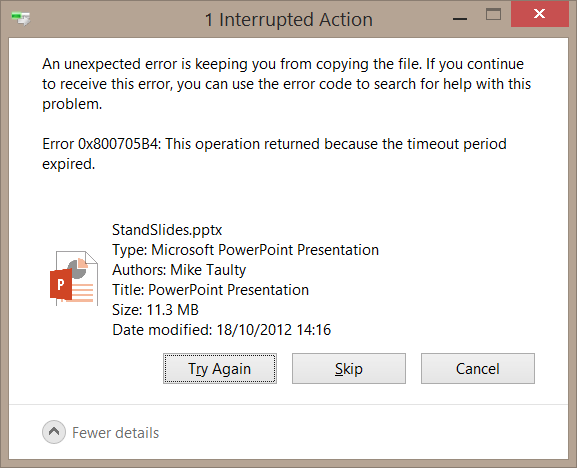 which didn’t seem so intuitive in the “Interrupted Action” title and the text itself because from my perspective as a user I’m opening a file rather than copying a file but this dialog tells me it had trouble copying a file. I tried to repeat this with PowerPoint itself rather than using my own code. 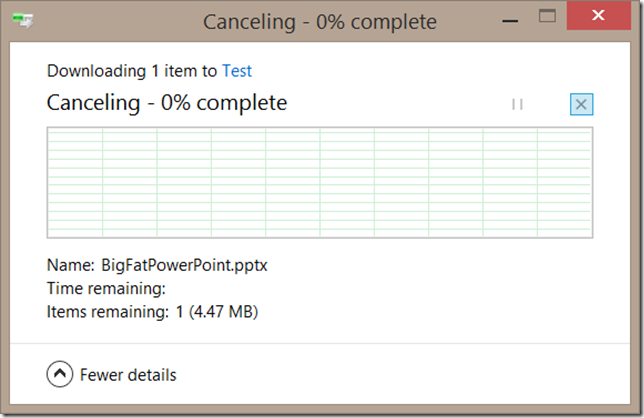 I took my machine off the network and I used the file open dialog in PowerPoint to open a big file that is on my SkyDrive but is set for “online only” access. I waited a little while and then got the same “Interrupted Action” dialog. It’s possible that there are differences here between what I get on the preview 8.1 OS and what happens in the RTM 8.1 OS so I’ll re-investigate when I’ve moved a machine to 8.1 RTM and will update the post if it’s different. Not all apps open all files via a file dialog of course. 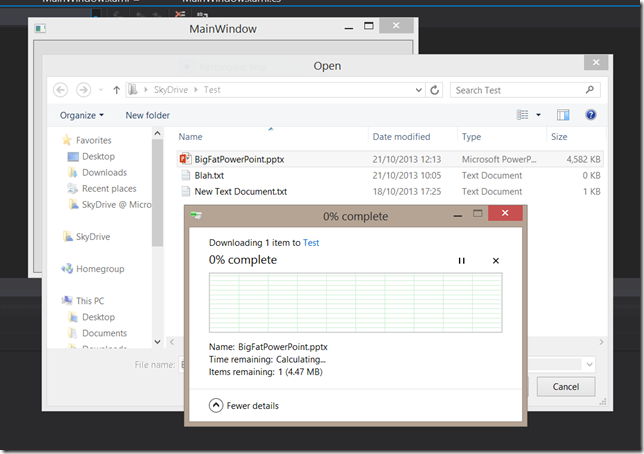 Many applications keep hold of file paths and simply read/write files on a user’s behalf using those file paths. 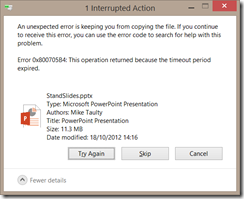 A typical example would be when Excel presents a file dialog for the user to select and open a file. Excel will then store that file path so that it can offer it to the user on a “Most Recently Used” list in the future without the user having to go through a dialog to get to the file again. It’s a simple convenience that’s been around for decades and it’s just one example. what was “interesting” to me about that file was that I couldn’t read it. I got back an exception (IOException with an HRESULT in it of 0x80070780). and, sure enough, that code seemed to mostly hold together and I could debug it to see my loop spinning and I could watch my network card activity as it pulled the file over SkyDrive and because I hadn’t put this work onto some kind of background thread it blocked the UI for a very long time indeed before finally coming up with the right number of bytes for the ZIP file in question. Of course, running the code for a second time gave me an instant result because the ZIP file is now down on the local hard-drive and there’s no SkyDrive work to do. So…it looks like reading from one of these files is possible but it’s perhaps got to be done at the shell level (i.e. IShellItem and friends) rather than at the operating system (i.e. CreateFile/ReadFile/WriteFile and friends) functions that .NET would usually use. I’m not sure whether there’s a great library out there that makes this sort of shell programming much easier so forgive me if I could have just used a library for this with all the interop code already baked into it but I know that for a very long time the Windows Shell and .NET didn’t mix too well together so that library might not even be out there today. Via a file/folder picker. The user gets presented with a dialog and they give a file/folder to the app. Via a library. The app has access to one or more of the user’s libraries (e.g. music) and that library happens to contains files from SkyDrive. Via share. It’s possible for one app to share a file/folder with another app so I guess it’s possible that the source app could share a file that originated on SkyDrive. 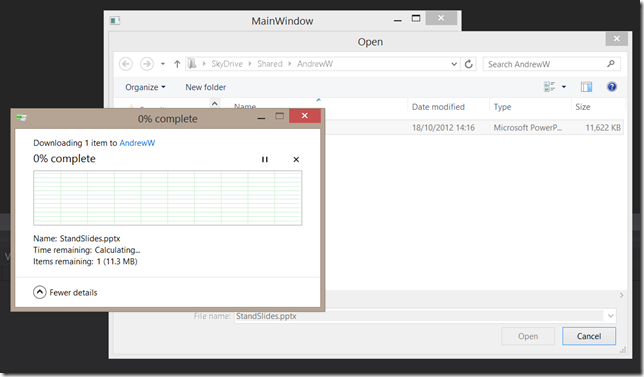 Whereas the built-in SkyDrive app has a complete view of the user’s SkyDrive as represented on the disk, a custom app can’t get that complete picture in the same way. There’s no API that serves that purpose. 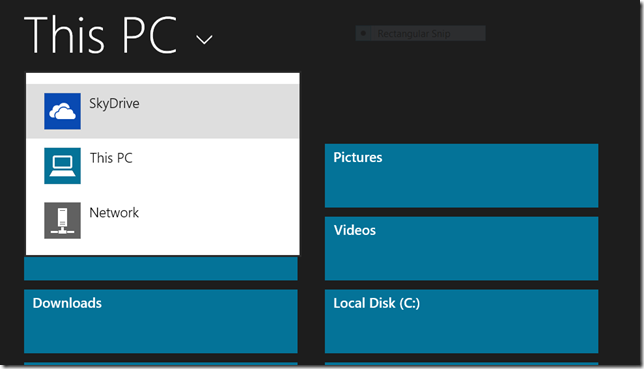 A Windows 8.1 app can do the same thing as an 8.0 app in that it could go across the web over HTTP to SkyDrive and try and build a complete picture of the user’s SkyDrive that way but that only works online and runs the risk of being out of sync with what’s happening on the local machine as in my previous example of creating the “foo.txt” file while offline. It’s perhaps fair to say though that most apps won’t need complete access to all of a user’s SkyDrive content – that’s perhaps a job that’s mostly handled by the SkyDrive app itself. App asks user for access to a file. User says “yes”, hands the app a file. App stores the path of the file for later use. User runs app again, starts new process which uses saved state to revert back to its previous position. App attempts to use file that was previously granted to it by the user but no longer has access. There are ways of handling this (see MSDN http://msdn.microsoft.com/en-us/library/windows/apps/windows.storage.accesscache.storageapplicationpermissions.futureaccesslist.aspx) but it’s something that always has to be factored into handling files in a Store app. 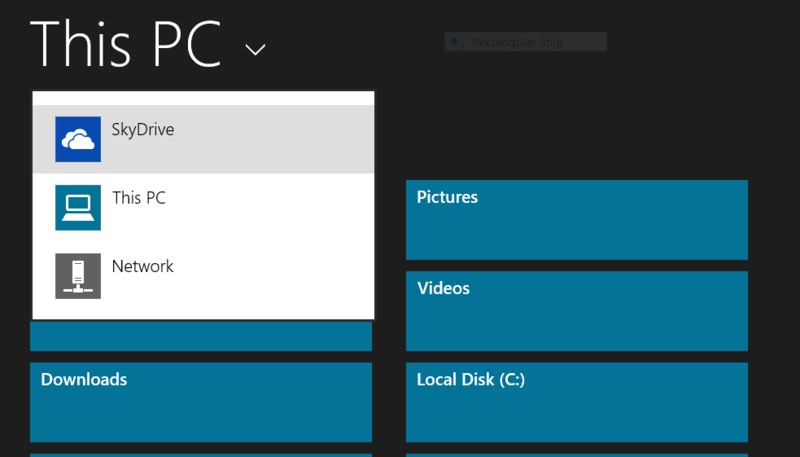 The other thing that has to be factored into a Windows Store app is the asynchronous nature of the file/folder APIs which, no doubt, helps when the content of the file might first need bringing across the network from SkyDrive and so becomes much an asynchronous operation that takes a lot longer than just reading a file from a solid state drive. // or can be downloaded. // fail and I'm doing nothing with that here. but I was surprised when the debugger hit line 8 of that code above and the StorageFile.IsAvailable flag returned True which suggested that the file was available. That seems wrong to me so I wonder if it’s a “preview thing” but it’s definitely what I saw and I would then find that my call on line 12 to OpenAsync would return ok but the first read call on line 18 to ReadAsync would timeout after quite a bit of time and leave me with an IOException wrapped around a timeout. That was a bit of a surprise – I was hoping the IsAvailable flag would stop this happening but it’s maybe that I’m seeing some freak result. If I switched the network to be back on then the file would load just fine. 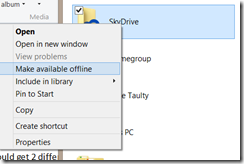 for a situation where my machine was offline and the call to NetworkInformation was returning “offline” I found that even if I used the dialog to pick a folder which contained “online only” files – i.e. files which should not be available offline I was still getting the IsFileAvailable flag returned as true which leads me to think that this is perhaps either a “preview thing” or a “my machine is busted” thing so I’ll definitely revisit on the RTM version when I finally get around to upgrading my machine. Assuming the IsFileAvailable flag is just a glitch, I wanted to see what would happen if I asked for thumbnails in both online/offline scenarios and I thought photos would be a good choice for that so I added a simple FlipView onto a UI and fed it some thumbnails from a photos folder on SkyDrive. which kind of makes sense and in the situation where the network was available and I was requesting a thumbnail that I hadn’t given the system any chance to figure out previously then I would generally see this image load as the first thumbnail my app was presented with and then the real thumbnail would arrive as an asynchronous update to what was on the screen. That all seemed to work pretty well. What I don’t know (because I didn’t yet manage to get any kind of trace on it) is whether the system was using some cleverness around requesting these thumbnails – that is, for a 640 thumbnail of a big image is it doing the resizing work on the server-side and only bringing across the network the small image required or is it bringing across the whole image and then resizing it locally. I wasn’t surprised but I did find it slightly odd that I can add a folder from SkyDrive into my pictures library but I still can’t add a folder served off a NAS box as a network share into that library. I know that there are ways around this with one of them being to create symbolic links in the file system but it surprised me that there’s not a better, built-in way of dealing with what might be a fairly common scenario. // nasty hack so that this class has a dispatcher to play with. and that seemed to work as expected – i.e. when offline I get thumbnails for the files from the library that are in my local file system plus any thumbnails that the system has already built for files that are on SkyDrive. For files that are on SkyDrive where the system hasn’t already built/cached thumbnails I just get placeholder thumbnails. Once online, of course, I get thumbnails for everything. and that seemed to work fine. Everything that I’ve tried so far relates to reading files. I guess that’s the more obvious side of things to explore because of the tantalising way in which SkyDrive offers “smart files” to an application that may or may not actually be available based on their “online only/offline available” status and the presence of a network connection. But what about writing files? The “nice” thing about this new model for dealing with SkyDrive files is that the system will present the user with their SkyDrive “structure” whether or not they are online and an app can write into a file and then let the system deal with sync’ing it to the cloud at a later point. That, presumably, makes the business of writing a lot easier than reading although that leaves to one side the obvious issues around concurrent writes to the same file on different devices and how the synchronisation process deals with that. and that seems to work quite nicely and quickly and unlike in the read-case I don’t really have to worry about “SkyDrive not being there” because, from the point of view of writing SkyDrive is always there (AFAIK!). There’s some impact here for a non Windows Store application like a desktop application – it’s possible that a user could present you with a path to a file that doesn’t necessarily behave quite like a regular file any more and you’d have to be a bit careful with that. It’s similar to a user presenting you with a networked file path but not exactly the same. For a Store application, the impact seems smaller. The user presents the application with “files” via one of a number of mechanisms including pickers, libraries and so on and then the app works with those files as though they were local files even if they are, in reality, stored elsewhere. The StorageFile.IsAvailable flag feels like it becomes really useful and I’ll update this post as/when I’ve worked with it on the RTM version of the OS as I think that’s key to an app being able to figure out what files are/aren’t present on the device but, naturally, that availability is always subject to the race condition of losing a network connection at any time in your code. I think the main impact for a Store app is then one that should already be encoded into every Store app which is treating files as truly asynchronous operations. Now, the WinRT APIs already force you to code asynchronously against files so why do I say “truly asynchronous operations”? What I mean by that that is that an app has to think about files potentially coming from anywhere, not necessarily being available and even when they are available taking a long time to bring across a network. I’ll admit that I’ve built Windows Store apps already which handle IO asynchronously but don’t factor in the idea that file IO might take a long time and that a file which seemed like it was available might not actually be available – that’s something that I would rework if I visited those apps again or in creating new apps in the future for Windows 8.1.